Overspend on transportation from Dubrovnik airport to the city is a mistake that people who fly to Dubrovnik airport often do so try to avoid it if you can. When you arrive at the Dubrovnik Airport, as soon as you pass the passport control and luggage collection, you will be bombarded by local taxi and minicab drivers offering you the best rates for transfer to the city. Dubrovnik Airport ‘Cilipi’ is only 20 km from the Dubrovnik city centre (Old Town). I would suggest you that first of all, if you consider taking a taxi to your accommodation, you should check the prices in advance – look for a yellow sign at the airport lobby that displays current and official prices. The sign show all currently official prices and your taxi driver should ask you to pay your fare according to them. Additionally, as Uber is now operating in Dubrovnik it is actually cheaper to use Uber to take you from the airport to any location in the town than to take a taxi. I just checked the price on my smartphone and Uber is quoting me between 185 and 235 HRK (Kuna) which is 25 to 31 Euro for one-way transfer. That’s much better alternative bearing in mind you don’t have to have cash ready to pay for your ride. This is also a better option if you did not bring any local currency with you as Uber rides are paid directly via the application. In my opinion, unless you have mobility problems and if you are not in a terrible hurry (and don’t mind to use public transport) there is no reason at all to use a taxi. 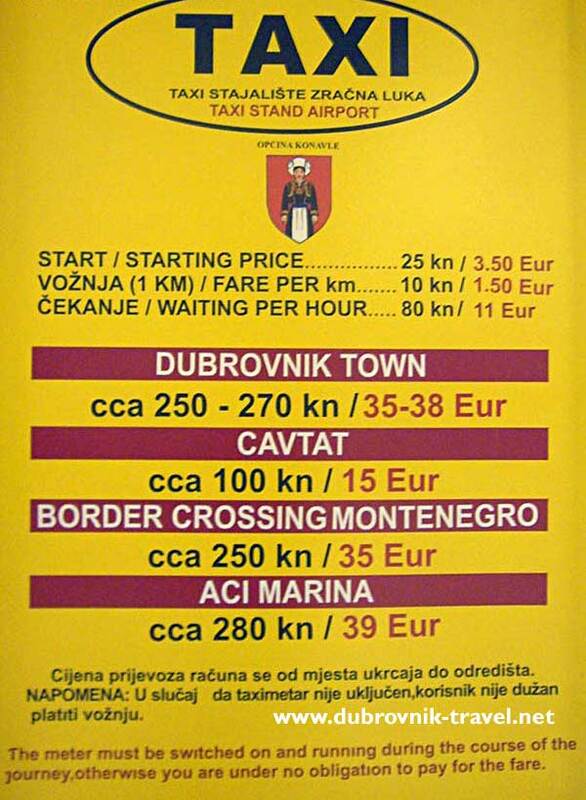 If you use that bus, instead of 35 to 38 Euro you will pay just 40 Kuna (5 Euro). You will arrive in the town at the approximately same time (20 kilometres is about 30 minutes ride, depending on traffic). The buses are comfortable, air-conditioned and offer much better views (as you are sitting higher) then small cars. Note – views should not be ignored as the road that leads from the airport to the town runs along the nice coastline and on the several points you will see the Old Town walls from your window. On your way back to the airport you can use the same service as the bus leaves the town for 1 hour and 30 minutes before each flight departure.